Bänoo Zan is the pen name adopted by this Iranian-born poet, translator, teacher and poetry curator who settled in Toronto in 2010. In 2012 she founded a poetry salon called Shab-e She’r, or Poetry Night in Persian. She earned a B.A. at Shiraz University and a masters degree in English from Allameh Tabatabai University in Tehran. In Canada, she undertook additional training in teaching English as a Second Language at the University of Toronto. Port Perry, ON: Piquant Press, 2017. … a book of poetry written by a daughter to her father whose funeral she cannot attend in another country due to the political climate. 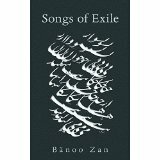 The poems in Songs of Exile are not simply about geographical or political exile. They reveal a metaphorical exile from the poet’s lost self, the one she left behind in Iran, her place of origin, the one she has struggled to preserve all her life. They reveal concern about the Middle East and the negative associations with Iran; preoccupation with the possibility of reconciliation between the three Abrahamic religions; worries about family back home; and broodings on newly found friends and lovers. In these poems, the political is personal.